A retail unit currently occupied by a restaurant in an apartment block in Belfast's Custom House Square has gone on the market for £370,000. The unit is occupied by Cafe on the Square, which is unaffected by the sale. The unit, which is being sold as an investment, was developed by DASC Construction, based in England. It's let on a 10-year-lease, with a tenant-only break option at the end of the seventh year. Selling agents Lambert Smith Hampton described the site as an "attractive retail unit, fitted out to a high standard". There is an initial rent of £30,000 per annum paid by the tenant. In the brochure, Lambert Smith Hampton said the property benefits from close proximity to Cathedral Quarter - "the city's premier destination for bars, restaurants, hotels and city living". "A dynamic mix of occupiers, against the backdrop of some of the city's oldest and most beautiful streets and buildings sets the location apart as one of Belfast's most exciting places to work, visit and live," it adds. The brochure also outlines how close it is to corporate occupiers such as law firms Allen & Overy and Tughans, Grafton Recruitment and Royal Mail, as well as the proximity of the new Ulster University campus. "There are a number of public car parks in the locality and excellent road infrastructure provides easy access to the motorway network, which is around 0.5 miles from the property," it says. 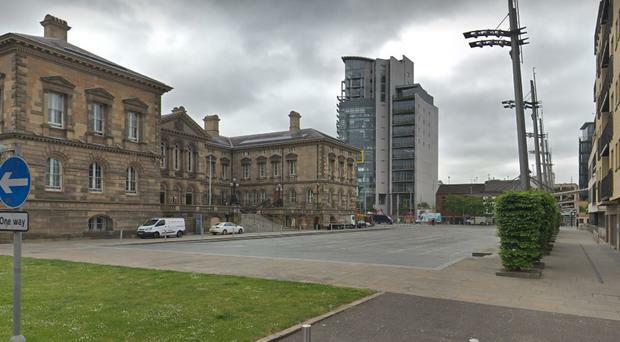 "Customs House is a key link between the Cathedral Quarter, city centre and The Waterfront/Titanic Quarters." The brochure describes Custom House Square as one of the premier apartment blocks in the city, with a "marble, stone-rendered and wooden-decked facade" complimenting the building's "iconic" appearance. The brochure adds that the unit measures 2,238 sq ft and also comes with one car parking space in the underground car park. "The original design allows for sub-division into two retail units in the future if so required or other uses subject to planning." Cafe on the Square is the first tenant of the ground floor unit of Custom House Square, although the apartment block opened in 2009. Speaking when the restaurant opened last year, DASC Construction director Shane Corr said: "DASC Construction has successfully delivered many developments similar to Cafe on the Square right across the UK, and we believe there is a real gap in the market for an eatery of this quality to land in the area. "We wanted to make a positive contribution to the area, not only for the residents in the Custom House Square residence development, but also for local businesses, students and tourists who find themselves within close proximity to the cafe every day."